As one of the major healthcare networks in Northeast Indiana, Lutheran Health Network serves more than 50,000 inpatients and hundreds of thousands of outpatients each year. Lutheran Health Network is a healthcare system with multiple locations and satellite offices that serve 23 counties in northeastern Indiana and northwestern Ohio. 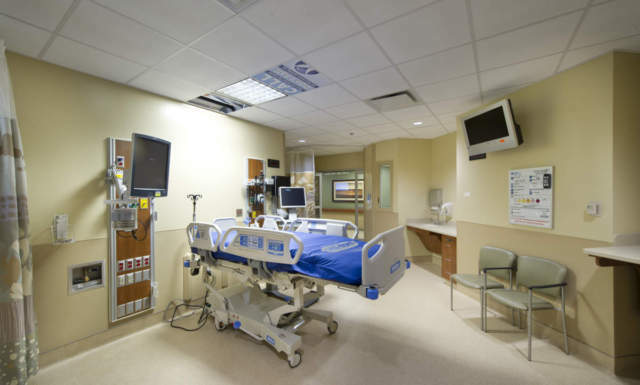 In 2012, a 60,000-square-foot fifth floor was added to Lutheran’s existing, occupied hospital facility. An unusual challenge with this project was the charge to keep public and patient access to the hospital virtually unchanged during construction. A crane was erected inside an existing interior stairwell, rising through the roof to aid material transport from the ground to the construction site.